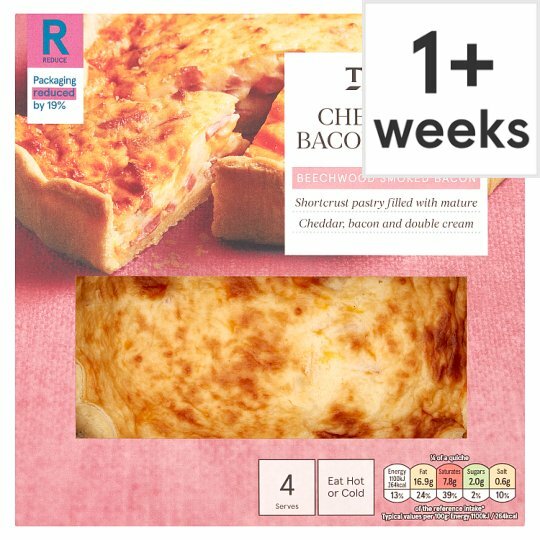 Beechwood smoked reformed bacon with added water, Cheddar cheese and Red Leicester cheese baked with eggs and double cream in a shortcrust pastry case. Beechwood smoked bacon Shortcrust pastry filled with mature Cheddar, bacon and double cream Our recipes have been created by our chefs using double cream and eggs for a rich creamy filling. Our quiches are then baked by our experts for a golden crust. Semi Skimmed Milk, Wheat Flour (Wheat Flour, Calcium Carbonate, Iron, Niacin, Thiamin), Pasteurised Egg, Beechwood Smoked Reformed Bacon With Added Water (13%), Extra Mature Cheddar Cheese (Milk) (9%), Onion, Palm Oil, Red Leicester Cheese, Double Cream (Milk), Cornflour, Maize Flour, Rapeseed Oil, White Pepper, Nutmeg. Beechwood Smoked Reformed Bacon With Added Water contains: Pork, Water, Dextrose, Salt, Stabilisers (Sodium Triphosphate, Sodium Polyphosphate), Antioxidant (Sodium Ascorbate), Preservative (Sodium Nitrite).